Rob had a birthday this past week. He collects cufflinks and has many interesting novelty pairs, including a couple I have made from Scrabble tiles and Legos. This year I was thinking it would be fun to have a pair made from the bottle caps of an iconic beer–maybe PBR or something. Dorothy and I keep a stash of bottle caps for crafting so I checked them to find a fun matching pair but all I found were caps from yuppie imports, nothing with the “real man” cache as Pabst Blue Ribbon. 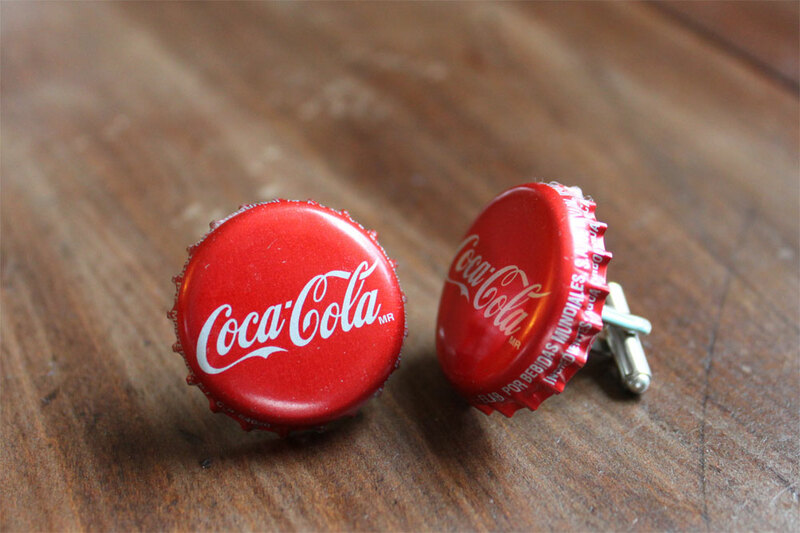 I did find some Coca Cola caps, however, from a case of Mexican Coke (made with actual sugar!) we’d bought on a whim last year and enjoyed by drinking with ice cream (him) and bourbon (me), and decided these would work. I glued three stacked pennies inside each cap to make a platform for the cufflink hardware, then glued it on and that was that. Making cufflinks is really a three-step process: 1) find what you want to use, 2) acquire cufflink hardware, and 3) glue them together. Done! 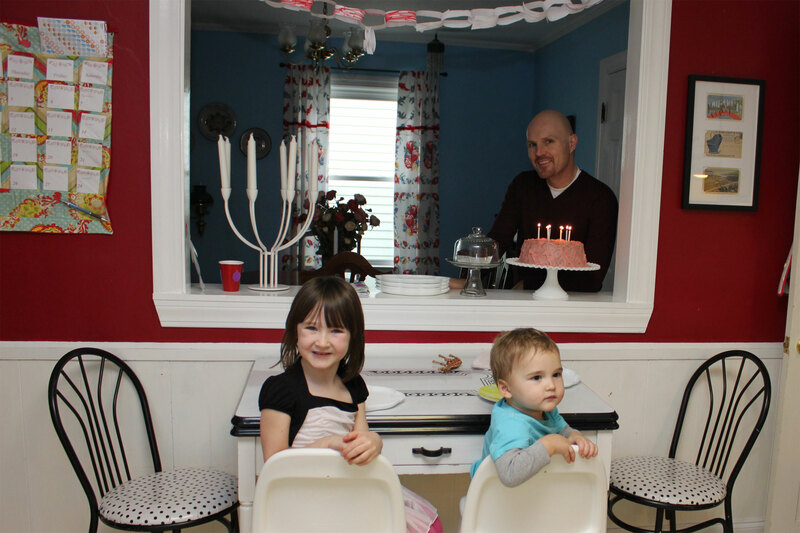 Here is my crew getting ready to sing the birthday song to Dad. Dorothy made the paper chain decoration like last year, and I made Rob’s requested angel food cake with strawberry icing and also devil’s food cupcakes for the chocolate-loving sinners like me. Worth has just recently graduated from his high chair and is proud to be seated in an elevated chair at the table with his sister. Dorothy decided to sew yesterday. I gave her some scrap fabric and she announced she wanted to make a pair of mittens for her brother, a simple thumb-less pair just like some he’s already got. 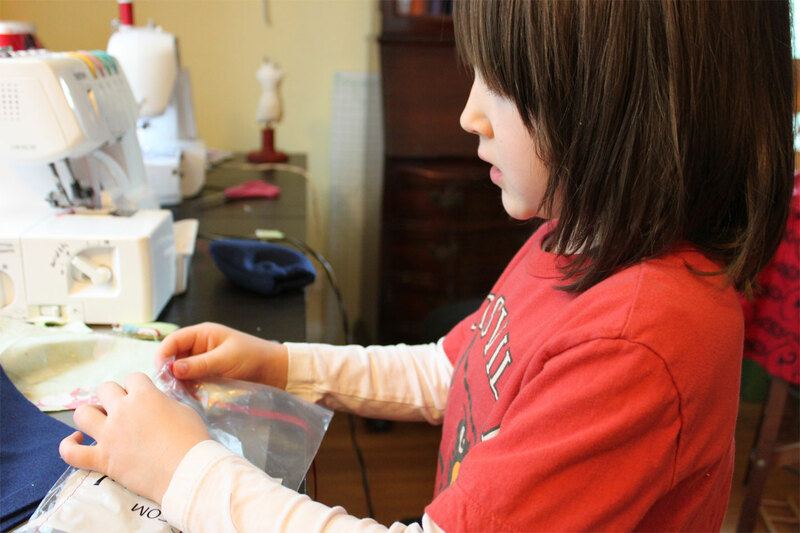 I don’t like to get in the way of her crafty experimentation, so I allowed her to cut mitt-shaped fabric much too small. She impressed me by turning the fabric right-side-in before stitching around the perimeter of the mitt, but once she turned it right-side-out she realized the sizing problem. Undaunted, she stitched up the other mitt and presented them to him, saying, “Buddy! I made you finger-warmers!” And he wore them around the house proudly. After a few minutes, though, she got to thinking maybe she wanted to try again. This time she asked for my help and suggested that her previous design might also be improved with some elastic. I unearthed some scrap fleece which I thought might make better mittens than the cotton, rounded up the requested elastic, and together we cut out much larger mitt shapes. She stitched around the edges and I helped her make a casing for some elastic at the wrist. Our joint venture just about fell apart at this point because she could not get the hang of pushing the elastic (with attached safety pin) through the casing. She shoved it over to me and just wanted me to do it for her, but I knew she’d enjoy this project more if she could really call it her own. 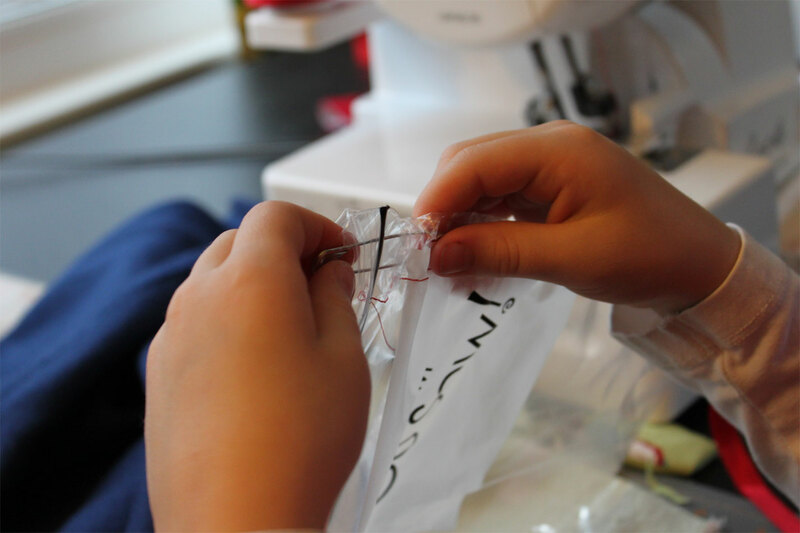 I got an idea to sew a casing into the side of a plastic bag, so she could practice threading the elastic through it and actually see the progress she was making through the clear sides. This worked perfectly. Dorothy figured out how to push the elastic through very quickly and then did it several more times. 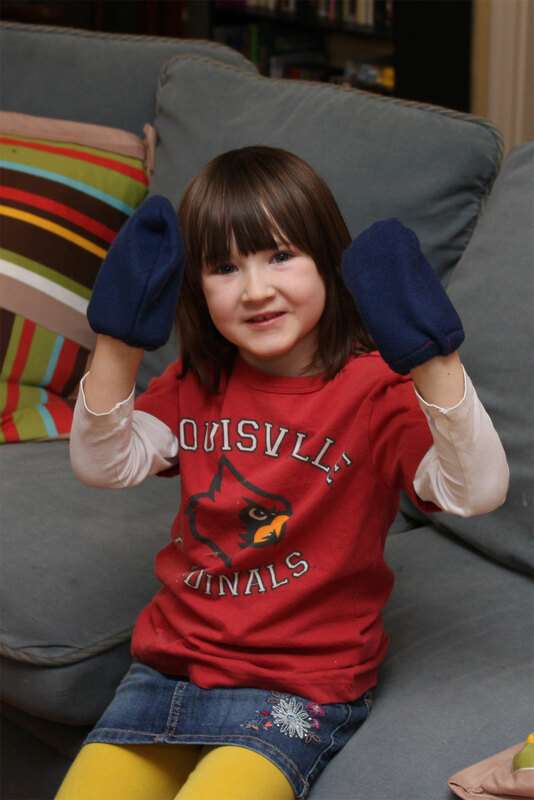 She was rightfully proud of the mittens she made her brother, modeled by her because he refused to have his photo taken in them. He’s fond of them too, since she made them, and I’m hopeful he might even keep them on outside. I just realized that this blog’s second anniversary has now come and gone. Two years! That doesn’t seem right, but as I’m browsing back through my early posts it seems even longer than that, making tiny things for the “big” boy who now sits at the table, and then admiring his wee ways. Dorothy’s grown so much in this time too. I’m glad to have this record to reflect on; thanks for joining me! I never know what to hang on the front door after Christmas. Holly berries no longer seem right, but it’s definitely not time for spring flowers either. I decided to buy a cheap thrift store wreath and winterize it. 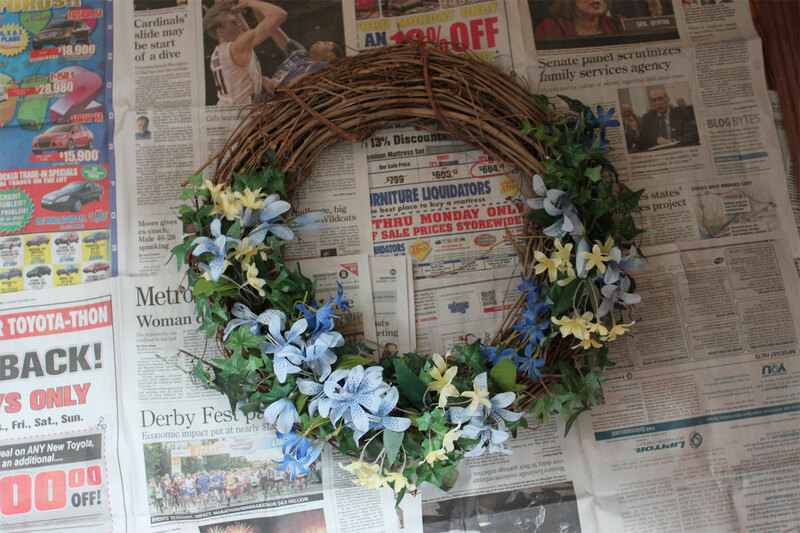 The photo above is the wreath I started with, purchased for about $2. I lightly spray-painted the whole thing white. The original colors still show through, but it looks kind of frosty. Then I added silver snowflakes (white ones from a craft store, spray-painted silver), a colorful bow, and a vintage bird I found at a yard sale last summer. 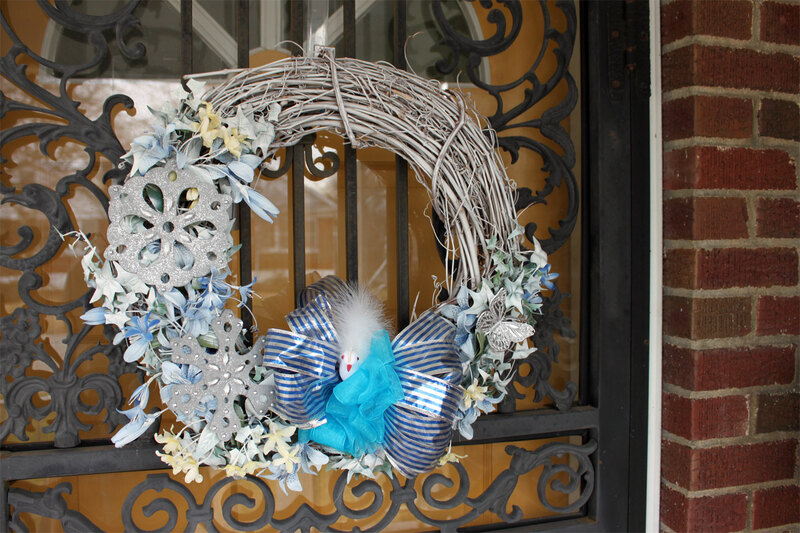 I like that the blue gives a little color to my winter front porch but I still feel seasonably appropriate. This might not be the best photo of my new pillowcases but at least it shows them in action. The striped print, Robert Allen Kukula Pinata, coordinates with my new curtains (finally all finished!) in Kiki Pinata. I like that the boldness of the stripe and color anchors my sort of washed-out old sofa, but that it isn’t so matchy-matchy with the curtains that anyone is going to get seasick from all the flowers. The kids and dog obviously like them as well. 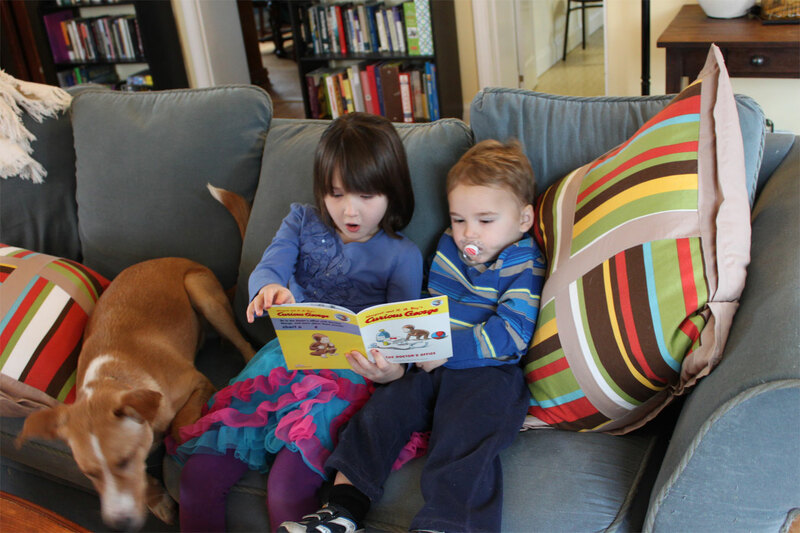 It has been part of our daily homeschool routine for Dorothy to read a book or two to her brother, so that is what is going on here. I don’t actually want to talk about why my 22-month-old is sucking on a pacifier, and since this is my blog, well, I won’t. Belle’s doggie bed was originally intended to occupy space on the second floor of our home, but it ended up being more useful in our main living space. The downside to finally finishing the curtains in this room was that the bed, covered in fabric to match my bedroom, now looked kind of clashy in the family room. I found a nice, washable fabric to make a new dog bed cover at Joann. It’s the Lisette brand but I didn’t see this print on the website. 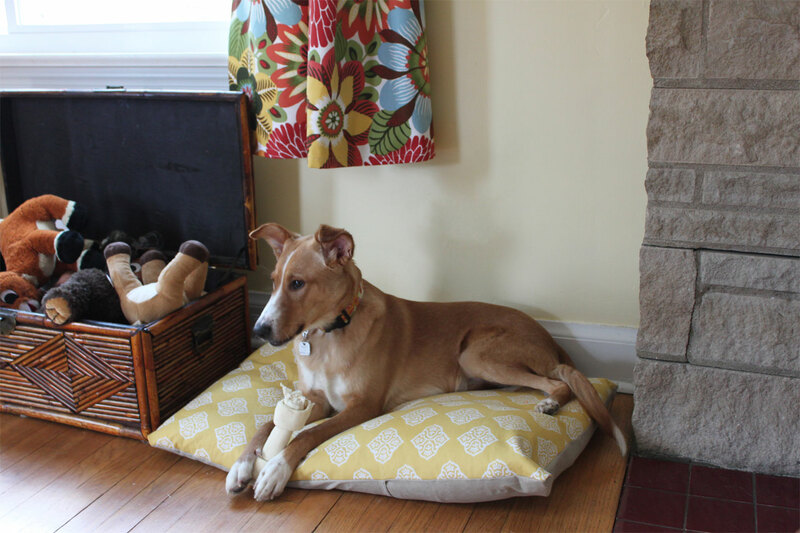 It looks like an Ikat print and is a color that should both match the room and the dog–so her hair won’t show so badly! Both the person who cut my fabric and the person who checked me out asked what I was going to do with the pretty fabric. It was kind of funny to tell them it was for my dog, but she should have pretty things too. Why not? 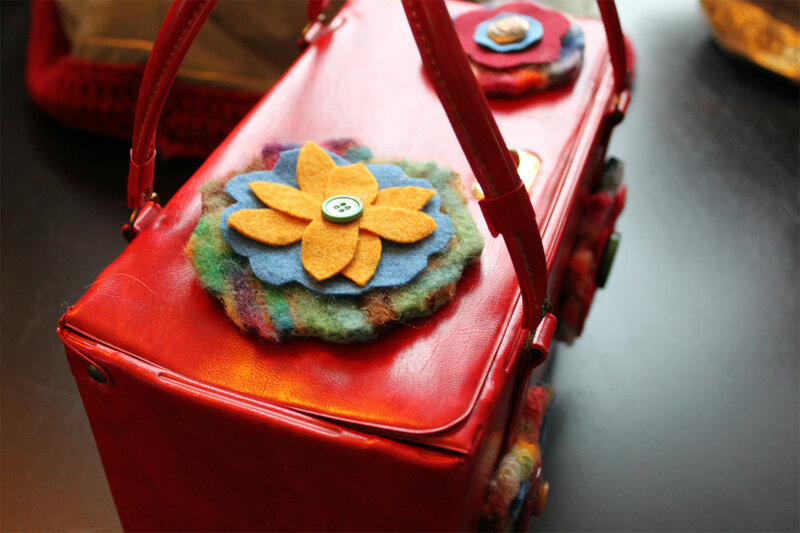 I have been looking for a camera bag. Standard-issue camera bags are both ugly and very expensive. 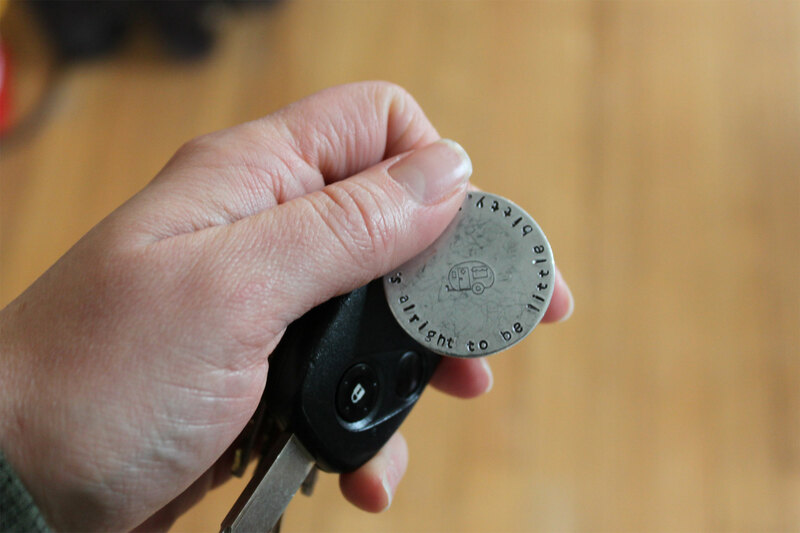 There are some fantastic ones on Etsy, but those are beautiful and very expensive. I’d been considering making a camera bag but the construction of a sturdy enough bag to protect my camera in transit had me a little worried. Then yesterday I found this red vinyl case at a thrift store. It’s got the look of something that might have been a gift with makeup purchase twenty years ago but it’s in perfect condition. It is sturdy, with hard sides and strong handles, and it is just the perfect size for my little DSLR with the flash attached. It was kind of awesome in it’s own right, in a red lipstick kind of way, but wasn’t my style. I thought I could make it better if I had different colored old vinyl bags to cut up and make into flowers, but, well, I didn’t have any of those, and thrifting more bags just to cut up to decorate this one didn’t really fit my project schedule or budget so I improvised with what I had on hand–felt. 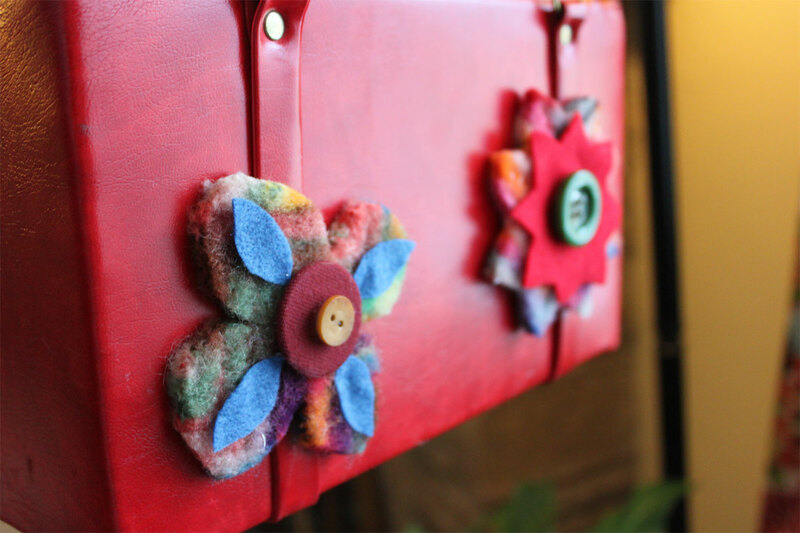 I used more of the felted wool blanket I’d used to make my Kindle case, plus other felt from my stash and some cool buttons to make flowers. I used hot glue to attach the pieces to each other and to the case. This project took less than a half an hour and I think I paid $2.50 for the case. Now this case is the kind of awesome that fits my style and I’m looking forward to using it for my camera. I’m also pretty sure that if I get tired of the decorations or want to change them that I can just peel off the glue. 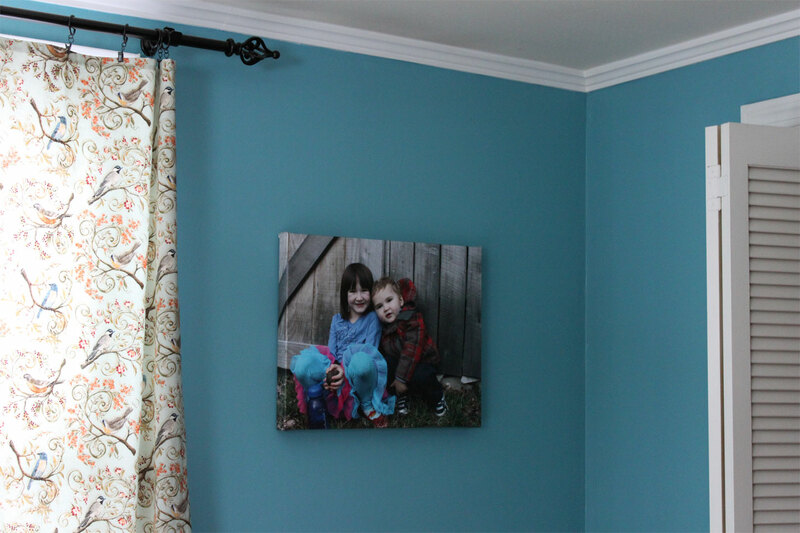 I’m also going to share a review of a recent purchase from My Pix 2 Canvas. I’d purchased a Groupon (or was it Living Social?) deal for this company and finally took just the right photo to try out their services. I snapped this picture of the kids in front of my brother and sister-in-law’s barn last week and I really like it. Both kids look like themselves, the weathered barn siding looks cool, and the colors the kids are wearing just happen to work really well in my bedroom, which is where I’d envisioned hanging my bargain canvas. Uploading and ordering the canvas was easy and it arrived fast. The print quality seems very good, although I’m less than impressed with the way the extra canvas hangs off loose in the back. There is also no hook or wire to hang it with. I’m still very pleased, though, and I’d probably order from this company again. The actual image quality and color faithfulness just seems a lot better than those I’ve seen at, ahem, large warehouse club stores, for example. Their regular prices are a bit high but it appears that discount codes are easily available with a little Googling. I like the look of traditional, framed prints but this is an inexpensive nod to this current photo-display trend, so I’m sold. I love that after-holiday feeling. As eager as I was to pull out the Christmas tunes after Halloween, I’m equally satisfied to have packed it all up now, returning to life as normal with a new zest. 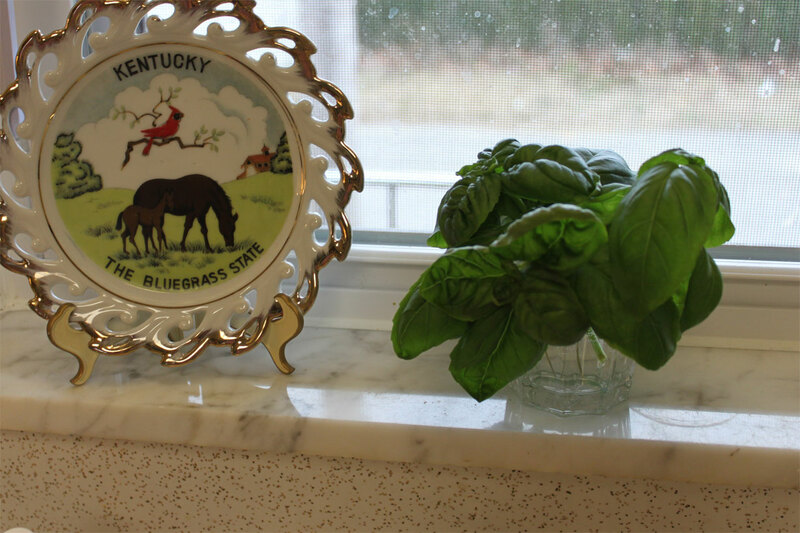 Doesn’t everything in the house look serene and uncluttered once the holiday decorations come down? I guess I took a little break from blogging during all the whirl of celebrations, but here are some photos I’ve collected to share. Belle got a new collar and tag in her Christmas stocking. 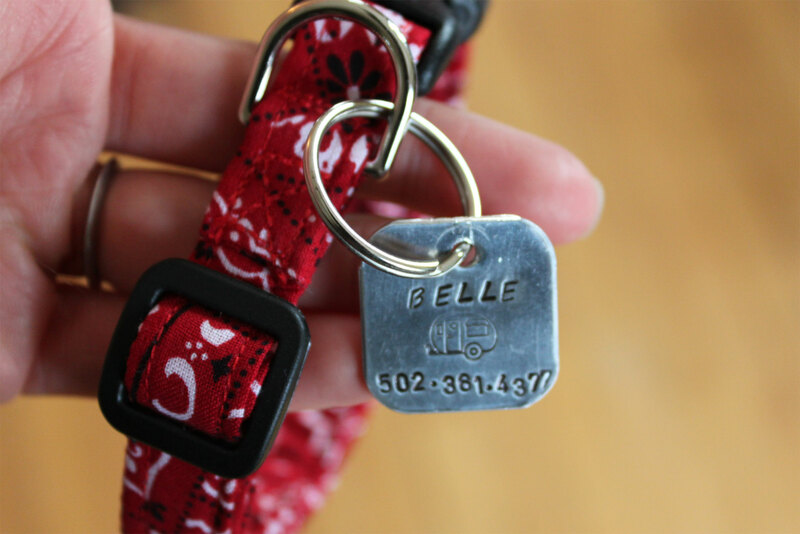 Her collar came from this Etsy shop, and the tag (check out that awesome camper stamp!!) came from this one. Maybe I should be embarrassed that my dog’s accessories will match my camper but I’m not. Belle seemed impressed with it, but was more impressed with the chocolate she stole from our kitchen counter on Christmas morning. If I’d had to make that phone call to the emergency animal hospital before Christmas I might never have been so generous with the dog gifts! But it all turned out fine…nothing says “Merry Christmas” like inducing dog vomit. Oy. At least she’s nicely accessorized. The owner of Stamped with Love also sent me this fantastic key chain, which I think speaks for itself. 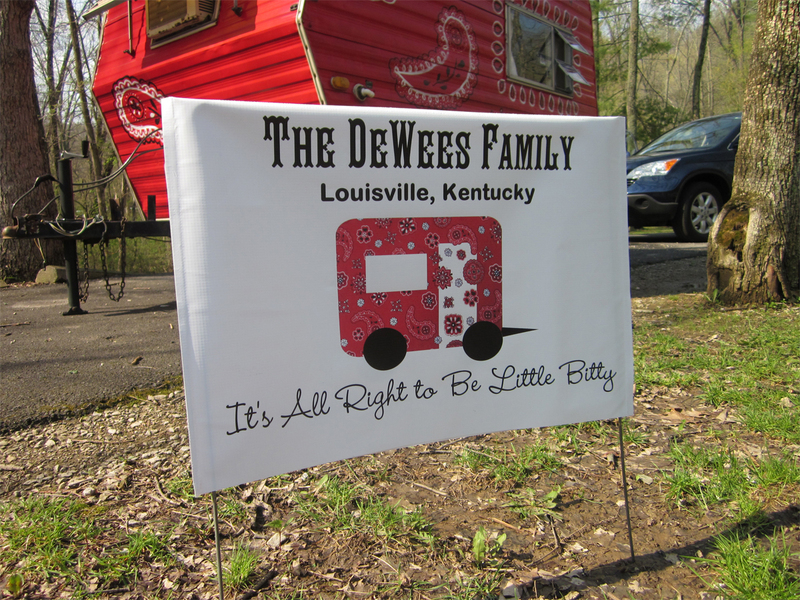 It’s stamped with the same words as our camper sign. I love it! This is my favorite picture from Christmas 2011. 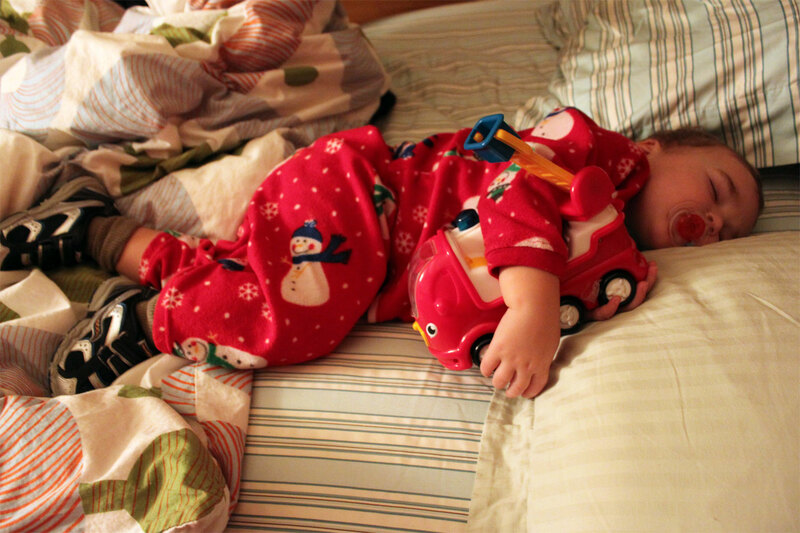 My boy refused to let anyone remove his new shoes from his feet and he slept with his arms around his beloved new fire truck. He’s still too little to grant affection to Christmas gifts on any other basis than how much he loves them in the moment, and these wee running shoes and charming fire truck took the day. Dorothy’s favorite gift (I think), after all was said and done, was the new “pet” mouse Santa brought. We’ve been reading the Ralph the Mouse books, so I purchased a very cute toy mouse and stuck it in a real cage with a real rodent water bottle and clean shreds of scrapbook paper. The cage has a handle, so Dorothy totes the whole setup around with her. She loves it. It wasn’t a homemade gift, obviously, but I did feel like my creativity in assembling it made it more special than the ready-made gifts she has played with less. 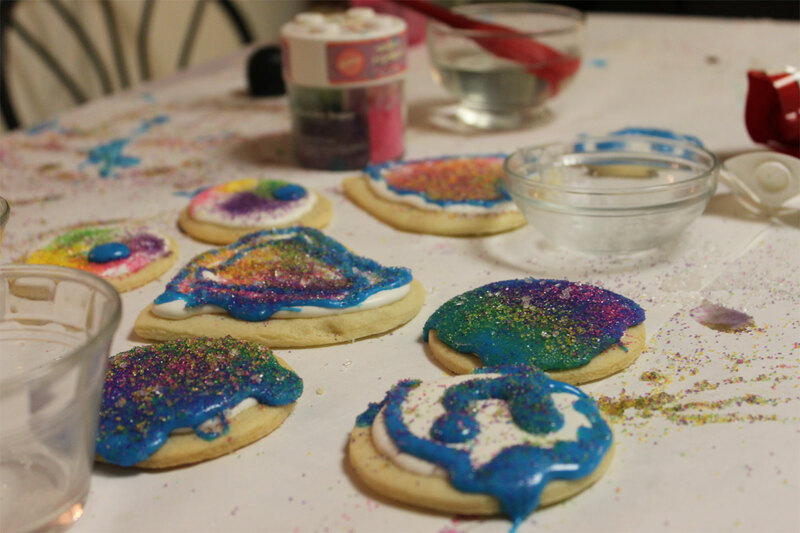 These are the sugar cookies the children decorated at our New Year’s Eve celebration with another young family. I baked the cookies using Martha Stewart’s sugar cookie recipe, then iced them with plain white royal icing, then let the kids do the rest. 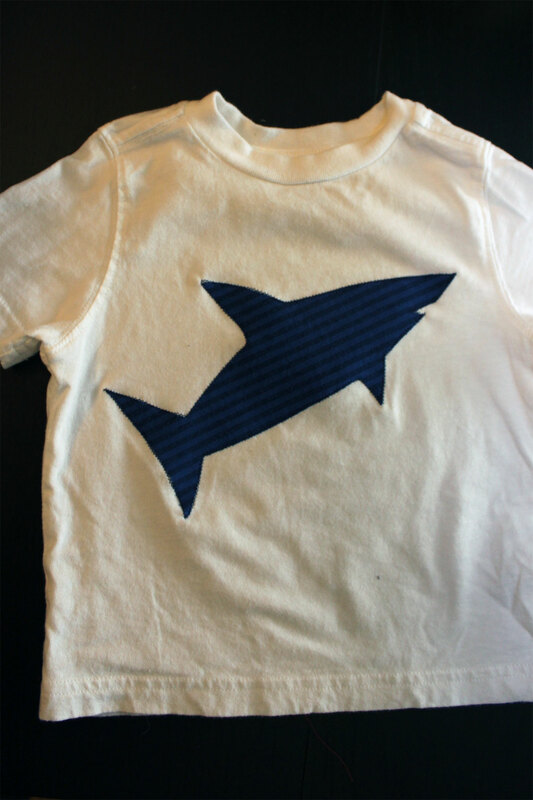 I put a shark applique on a plain white cotton tee as a birthday gift to a little friend who turned one on Christmas Eve. This felt like a useful and simple gift and I hope he likes it. And last but not least, one of my own favorite Christmas gifts was a bit of a long shot. Some time last fall before Rob injured his heel we concocted a plan to acquire family pogo sticks this Christmas (with the exception of Worth, who has just perfected jumping on his own two feet). I don’t remember now what made us think this was a good idea. In any case, Rob got a pogo stick but can’t use it until his physical therapist and surgeon allow him to do so (maybe March? 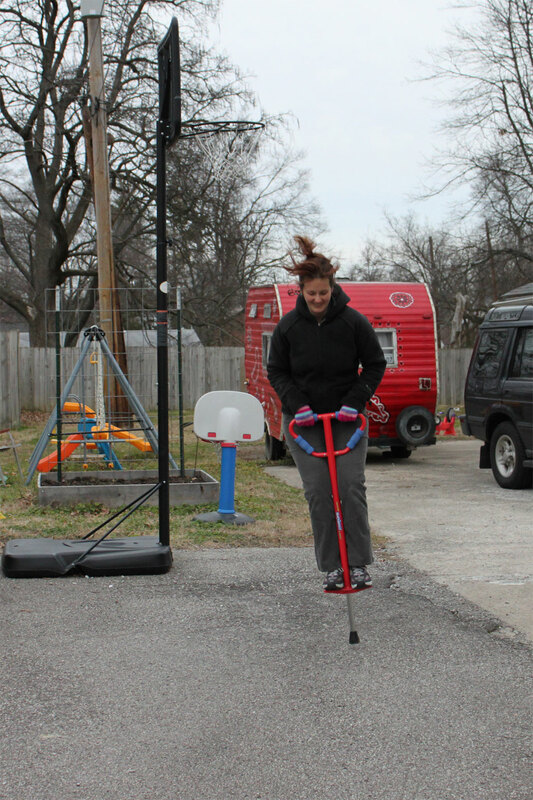 ), Dorothy got a pogo stick with a nice, wide, detachable base to ease the learning curve but is still a bit of a stretch for a novice pogo-girl in chilly weather, but me, well I’ve gone pogo crazy! I love it. I thought I’d never be able to get up on the thing, but it turns out that pogo jumping is rather like riding a bicycle; the muscle memory of the skill perfected as a young person followed me, forgotten but not gone, into my adulthood. Jumping on the pogo stick is the most fun exercise I’ve gotten in recent memory. It’s intense and makes the legs burn, but it’s so fun and thrilling I barely notice. I’ve been adding sets of pogo jumps to my day before and after our evening dog-walk, and the increase in heartbeat makes the whole endeavor more worthwhile, health-wise. If I’d just lay off the sugar cookies (see above) maybe I’d lose a few pounds too! I hope your holidays were wonderful!